The accommodation facilities in Val Gardena range from luxury 5 star hotels with extensive Service features to comfortable self-catering apartments. The hotels in Ortisei, S. Cristina and Selva offer comfort and wellbeing of the highest standard. Ski hotels, bike hotels, hiking hotels, family hotels as well as wellness hotels are specialized to the needs of active vacationers, families and relax vacationers and offer special packages and services. In the guest houses, residence and garni accommodations of the Valley you benefit furthermore from a personal service and South Tyrolean hospitality in a comfortable ambience. The offer of apartments in Val Gardena is large and leaves nothing to be desired. Do you prefer to stay directly next to the slope, in a central location in the village centre or in an ideal starting position for hikes? The choice is up to you. Those who prefer to stay in a rustic ambience close to nature should spend their stay in one of the numerous alpine huts of Val Gardena which offer impressing views. This portal assists you at your search for the suitable accommodation in your wellness- active and family holiday in the hotels, guest houses, apartments, alpine huts, residence and garni facilities in Val Gardena. Numerous gourmet restaurants in Ortisei, S. Cristina and Selva convince epicures with local and international specialties and excellent wines. Even shopping enthusiasts will be more than satisfied with the large number of shops in the shopping paradise Val Gardena. Clothing and shoe stores, specialized shops and wood carving shops offer a wide selection of quality products as well as expert advice and competent support. On our site you find useful information and phone numbers of the tourist offices Ortisei, S. Cristina and Selva, as well as from taxi companies, mountain guides, doctors and pharmacies etc. The holiday area Val Gardena, consisting of the villages Ortisei (1.236 m), S. Cristina (1.428 m) and Selva (1.563 m), is located in the heart of the UNESCO World Heritage Dolomites in South Tyrol. Val Gardena is characterized by its outstanding, high-alpine location. The valley is surrounded by impressive mountains such as the Sella group, Sassolungo group and Puez group and beautiful alpine pastures. The Sassolungo (3.181 m) which is the local mountain of Val Gardena is part of the Sassolungo mountain massif and a true highlight with its majestic appearance. Thanks to its natural beauty and favoured location the valley is a popular holiday destination in winter and summer. A variety of sports facilities guarantees a varied summer and winter holiday for the entire family. In your skiing holiday in the ski area Dolomiti Superski you profit in all villages of Val Gardena from the connection to the famous Sellaronda. The circuit around the Sella mountain massif leading you over 4 Dolomite passes, is an extraordinary tour which provides magnificent views. The ski area Val Gardena offers skiing pleasure with 175 km of slopes and over 80 modern lift facilities. Discover highlights like the longest ski run from the Seceda mountain station to Ortisei (10,5 km) or the challenging World cup slope Saslong which is annual venue of the FIS men races. Besides perfectly groomed slopes in all levels of difficulty you enjoy comfortable stays in the rustic alpine huts and refuges as well as entertainment in the Après-ski bars. Even cross country skiing enthusiasts find everything they desire in Val Gardena. Well groomed and maintained cross country skiing trails in Vallunga, in the nordic centre Monte Pana or at the adjacent Alpe di Siusi are available for beginners and advanced skiers. A wide range of other winter sports like ski touring, snowboarding, tobogganing, ice-skating and snow shoe hiking complete the program for your winter holiday in the Dolomites. The ski schools and ski rentals in the valley are your competent partner in the field of winter sports and equipment. They provide a varied offer of courses, professional support and first class material. Enjoy the summer in Val Gardena from its most beautiful side. Flowering alpine meadows and the steep rock faces of the Dolomites are a fascinating natural scenery. The smell of summer will accompany you at every turn. 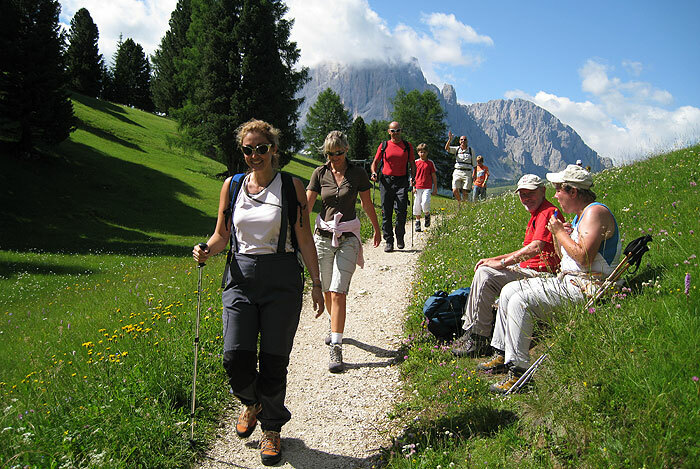 Explore the stunning landscape of Val Gardena on an extended hike or comfortable walk. 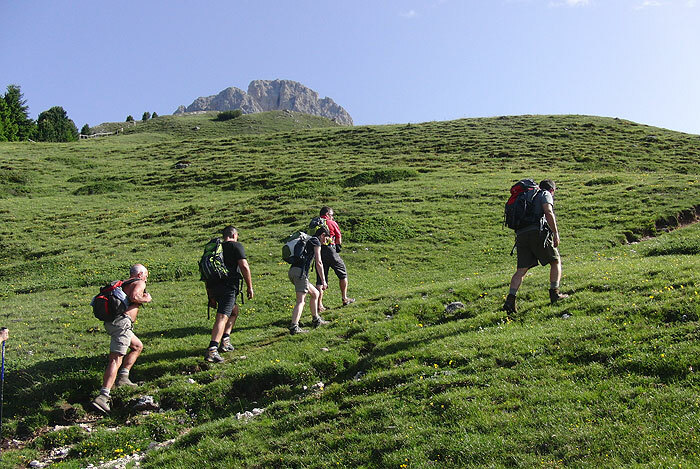 The experienced, qualified mountain guides of the alpine schools in Val Gardena offer guided hikes, vie ferrate and climbing courses. The spectacular panorama in the UNESCO World Heritage site can also be explored on a mountain bike trip. Mtb hotels, Mtb schools as well as Mtb rentals are specialized to the needs of cyclists and offer attractive packages. A wide range of summer sports such as paragliding, tennis, swimming and golf guarantee an exciting holiday for the whole family in Val Gardena. Besides the beautiful natural scenery which impresses at every season of the year, the holiday region Val Gardena offers also cultural highlights. Numerous sights such as churches, chapels, castles, monuments and memorials are worthwhile destinations for visitors interested in culture. The museum de Gherdëina in Ortisei and furthermore permanent exhibitions and presentations provide a insight to the Ladin culture and centuries old wood carving tradition. Spend a beautiful summer and winter holiday in the holiday region Val Gardena in the heart of the UNESCO World Heritage Site Dolomites. The community Ortisei has 5.791 inhabitants and is situated 1.236 m above sea level. The main village of Val Gardena is a popular holiday destination in the Dolomites and provides a large number of sport and spare time activities, numerous cultural highlights and first class gourmet restaurants. The picturesque village centre of Ortisei with the lively pedestrian zone is a popular place for shopping and relaxing. The offer of accommodation in Ortisei stretches from comfortable luxury hotels in central position to cosy apartments for the whole family. S. Cristina in Val Gardena has 1.900 inhabitants and is situated 1.428 m above sea level between the villages Ortisei and Selva, at the foot of the majestic Sassolungo. 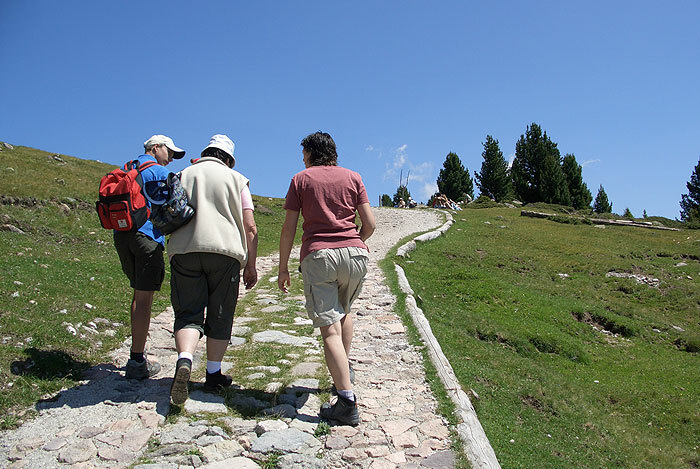 In summer the hiking paradise S. Cristina offers numerous hiking and walking paths amidst the fantastic Dolomites. In the winter months it provides well groomed ski and snowboard slopes in the skiing area Dolomiti Superski. S. Cristina in Val Gardena provides modern hotels as well as lonely located farms which offer unforgettable farm holidays. Selva in Val Gardena is located on an altitude of 1563 m in the heart of the Dolomites, at the foot of the impressing Sella mountain. Selva is one of the best known villages in the alps and a popular destination for skiers and hikers. With its connection to the skiing area Dolomiti Superski and the famous Sellaronda the village in Val Gardena is the perfect winter holiday destination in the Dolomites. 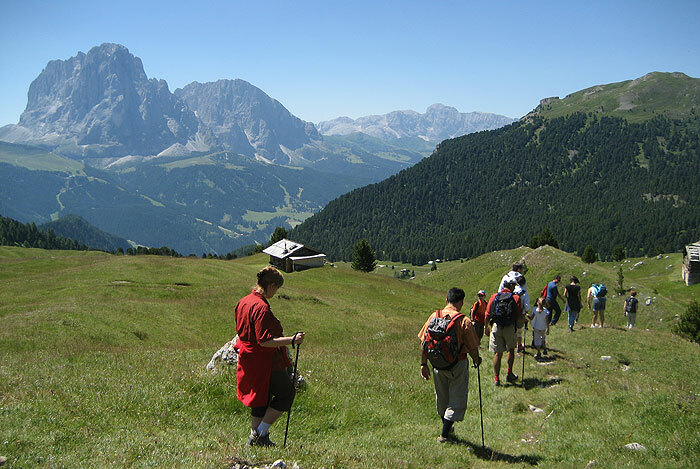 Active vacationers can explore the fantastic landscape of the Dolomites on individual or guided hikes, vie ferrate and mountain bike tours in summer. The choice of accommodation is varied and stretches from luxury wellness hotels to comfortable bed & breakfast with friendly atmosphere.